During the "Leggenda e Passione" sale at Ferrari's Fiorano test circuit, a very special edition of the iconic soft top will be auctioned off in aid of the Save the Children charity. One of the most important elements of ensuring Ferrari flagships retain their value and are viewed as absolute objects of desire is to ruthlessly limit production. The company never builds more than 499 examples of a hypercar, and the first model off the production line is never offered for sale. Instead, it joins the company's permanent collection and becomes a museum piece. However, when Ferrari decided to break with this tradition and build an extra LaFerrari and auction it off in aid of the rebuilding efforts following earthquakes that had devastated Italy, the car set a new world record. When it went under the hammer at a charity auction in December 2016, the car, which boasted a unique paint treatment and livery, fetched a staggering US$7 million, making it the most expensive modern car ever to sell at auction. And less than 12 months later, the company has decided to do it again. However, this time, the car is even more impressive. 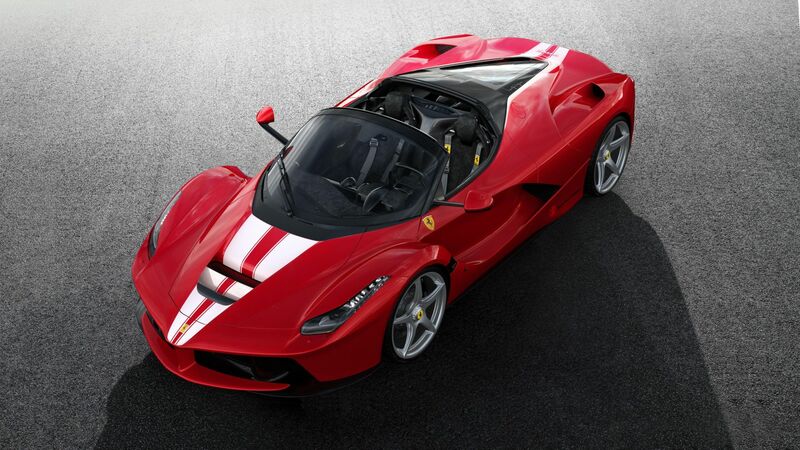 The Ferrari LaFerrrari Aperta is the soft-top version of the ‘standard' LaFerrari and was launched at the beginning of the year to mark the company's 70th anniversary. Every example was sold in advance of the car's official unveiling and every lucky owner of one of the original 498 examples is under strict orders not to sell their car on for at least the next two years, or see their chances of ever owning another limited-edition Ferrari significantly curtailed. The Aperta going under the hammer this weekend is finished in metallic Rosso Fuoco red features a unique metallic Bianco Italia double racing strip running from the hood to the rear. Inside the cabin is trimmed in black Alcantara and black carbon fiber with red leather inserts and red contrast stitching. The "Leggenda e Passione" sale, organized in conjunction with RM Sotheby's is the largest single marque auction in history. The three-day event will see 42 Ferraris going under the hammer including a 1960 250GT SWB Berlinetta. One of the most desirable of all cars ever to carry the prancing horse badge, it is estimated to fetch in excess of US$10 million. As for the unique Aperta, RM Sotheby's has estimated its value at between US$3.5 and US$4.5 million.